Precious metals futures were divided on Monday — though little changed overall — with platinum and palladium higher and gold and silver lower. Silver’s loss was its first in four sessions while gold broke its string of two gains in a row. Gold for June delivery dipped 60 cents, or less than 0.1%, to end at $1,314.10 an ounce on the Comex division of the New York Mercantile Exchange. "Dollar strength has been the most persistent headwind for gold in recent weeks," Peter Grant, a vice president at Zaner Precious Metals, told MarketWatch. The yellow metal "has displayed a modicum of resilience over the last several sessions, holding last week’s low at 1,300.67, even as the dollar index set new 4-month highs," he said. 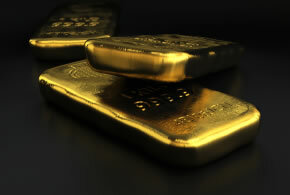 Gold futures ranged from a low of $1,310.60 to a high of $1,320.10. They fell 0.7% last week for their third straight weekly decline. Silver for July delivery shed 2.4 cents, or 0.2%, to finish at $16.495 an ounce. Silver futures traded between $16.43 and $16.60. They gained 0.7% last week. July platinum added $3, or 0.3%, to $913.30 an ounce, ranging from $910.40 to $920. Palladium for June delivery added $4.85, or 0.5%, to $962.10 an ounce, trading between $960.60 and $973.90. Last week, platinum fell 0.7% and palladium lost 0.6%. Gold down $5.65, or 0.4%, to $1,309.40 an ounce. Silver down 5 cents, or 0.3%, to $16.415 an ounce. Platinum down $1, or 0.1%, to $901 an ounce. Palladium down $8, or 0.8%, to $963 an ounce. Last week, LBMA metal prices posted losses of 0.9% for gold, 0.7% for silver, 1.1% for platinum and 2% for palladium. United States Mint bullion coins have yet to log gains in May. Below is a sales breakdown of U.S. Mint bullion products with columns listing the number of coins sold during varying periods.